If you are confined to a small space, or the only ground you have to work on isn’t that great, you do have options. Here’s a drill that NFR Qualifier, Futurity Winner, Calgary Stampede Champion Sue Smith does that will work in those cases. When your ground is poor and also when you are just learning this drill you can start at a walk-trot and still make a great difference in your horse. 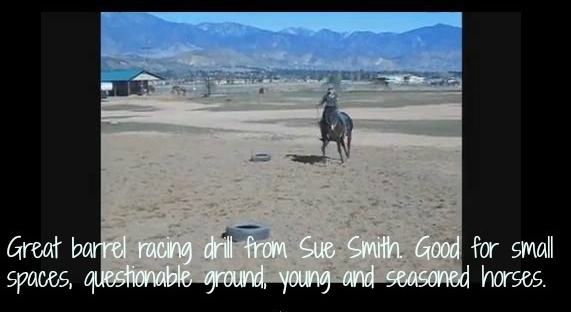 I give the rundown on the how, why and cautions you should take over at our sister site www.BarrelRacingDrills.com but you can watch this video of Sue doing the drill and give it a try for yourself. It’s a bit confusing to get the hang of but works wonders to get shoulder and hip control in young and seasoned horses. Disappointing to see it blocked from Canadians! It’s blocked because the song overplayed is copywrited. Remove the song and it will be unblocked. Could be! Not my video, so I can’t do that unfortunately.